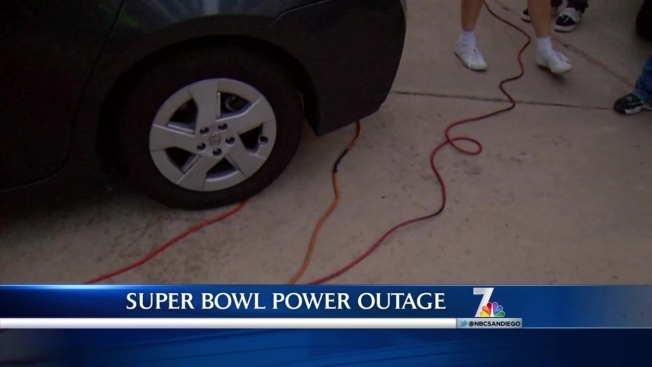 Just imagine – after weeks of preparing for a Super Bowl XLIX party, the power goes out just hours before the big game. It happened to residents in Escondido Sunday afternoon. Some residents were preparing food, friends were on their way over and suddenly they found themselves without electricity. Nearly 200 customers were involved in the outage according to San Diego Gas & Electric. Resident Randy Bolieu was prepared. He fired up his generator and hooked it up to two televisions and a refrigerator – critical appliances on Super Bowl Sunday. Tamera Rousell's family didn't have generators but they had they cell phones so, they decided to stream the game live through the NBC.com link. The Millers were the lucky ones. Without power for the first quarter of the game, they soon had their electricity restored. However, they say they had a backup plan if it didn't come back on. They were going to head to their neighbor’s home where there was a generator powering a television. Power has since been restored.